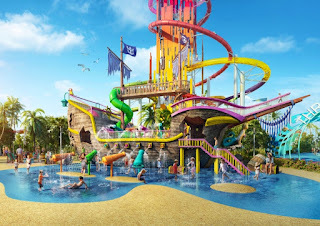 •Thrill Waterpark, featuring two water towers with 13 slides including the 135-foot-tall Daredevil’s Peak (this will be the tallest slide in North America), a large wave pool, and a kid-friendly obstacle course pool. •Oasis Lagoon freshwater pool. The freshwater pool will have three coves— one for families with a “kid-friendly beach-style entry area”, another for adults featuring a swim-up bar, and a third with private cabanas that will be available at an extra charge. 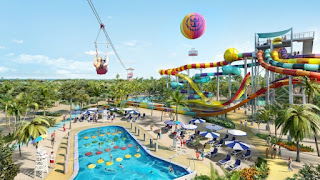 •A 1,600-foot zip line that crisscrosses the island at up to 50 feet high ending in a splash water landing. •A helium balloon, dubbed Up, Up and Away, floats up to 450 feet above the ground. •Two specially designed beaches: Chill Island for the ultimate beach escape complete with cabanas and daybeds, and the action-packed South Beach with volleyball, basketball, soccer, paddle boarding, glass-bottom kayaking, and zorbing (zorbing is the sport of rolling downhill inside a giant clear plastic ball). •Coco Beach Club featuring overwater cabanas. According to Royal Caribbean, the project has been in development for three. It will include “the installation of a pier that will be able to accommodate even the biggest of Royal Caribbean’s 24 ships”. The entire project is set to be completed by November 2019.